In addition to much fine solo singing, cast members – no matter the arrangement – sang duet, trio, and especially quintets with exceptional balance, where moments of rising 5-6 harmonic motion began to reveal the full magic of Mozart. British baritone Mark Stone, making his Santa Fe debut as Guglielmo, had an impressive technique that allowed his voice to widen during dynamic increase. As a result, Stone was best able to exploit the theater’s fine acoustic. American soprano Susanna Phillips’s (Fiordiligi) recitatives – nicely accompanied by fortepiano – were performed most fluently. In Act II, when lamenting, “I burn with passion, but no longer for a virtuous love…betrayal, let them be hidden forever,” Phillips used Mozart’s sparse accompaniment as an opportunity for musical flexibility; she personalized the section well with free, sweet high notes. This more than made up for nice musical attempts at expressivity in Act I, which occasionally resulted in sharpness. 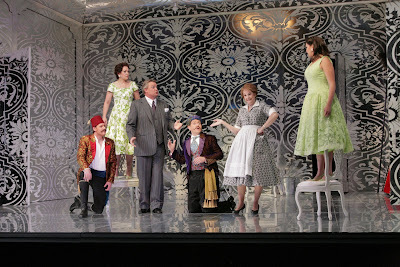 American mezzo-soprano Katherine Goeldner portrayed Dorabella memorably, when expressing to a disguised Guglielmo that “I cannot give what I do not own [my heart].” American mezzo-soprano Susanne Mentzer’s vast on-stage and teaching experience was evident in her entertaining turn as Despina, while American tenor Norman Reinhardt (Ferrando) lacked sufficient legato and support in his upper range. Though highly entertaining, the success of this production was limited by the rash conducting of London-born William Lacey, who never achieved rapport with the orchestra or cast. By attempting to create excitement through briskness, from overture on, all were left behind, especially in the botched accelerando at the end of Act I. At times, an entire beat separated singer(s) from orchestra. This production repeats on August 6, 13, 20, and 24.